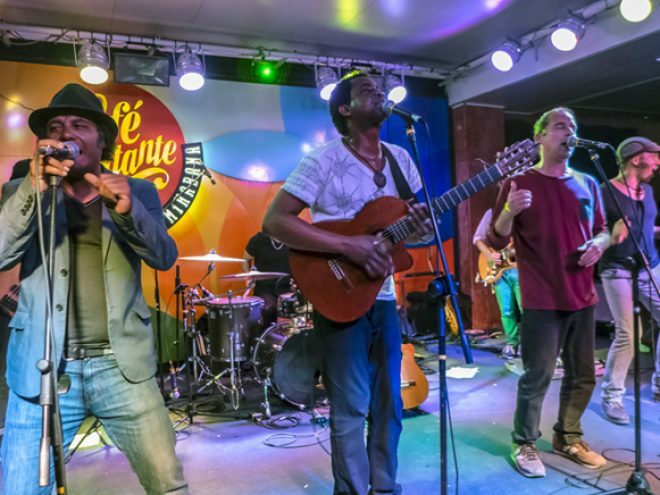 To set in context Habana Abierta emerged in the early 90s and had become something of a Havana urban legend – known through a handful of albums and with so few appearances that the last concert in 2003 in La Tropical becomes legendary. Vanito Brown: Chronicler of personal issues, a versatile songwriter. The scale of his work ranges from a contemporary rock ballad to the most traditional of Cuban music. Alejandro Gutiérrez: A modern-day bolerista, with Filin (feeling) and urban song influences of the continental south. Luis Alberto Barbería: The resonance of his voice and guitar work takes on Afro-Cuban rhythms. His melodies are lyrical with jazz influences. Jose Luis Medina: Refined pop successfully blended with son, guajira and guaracha, able to come up with the barest social criticism or the most conciliatory ballad. In 1998 they recorded 24 Horas, their second album. This was am eclectic fusion between popular Cuban music and funk, reggae and hip-hop. Rock and Pop Cuban-style with national roots: Conga-funk, timba-rock, bolero-hop, chachacha-blues, son and pop…you name it. In January 2003, after six years in Spain, they returned to Cuba for a series of sell-out individual shows, with a performance by the Habana Abierta full line-up at La Tropical, playing to with over 10,000 people. This gave rise to the Habana Abierta documentary directed by Jorge Perugorría and Arturo Soto, which was presented at several film festivals.